Discussion in 'Mobile Tips/Plans and Internet Discussions' started by yomitech.com, Oct 12, 2016. It's no more news that Samsung has officially stopped production and sales of the Galaxy Note 7 after series of exploding devices. The company made the announcement after the Recall process which was suppose to fix the battery defect ended up being a complete failure as there were more cases of the note 7 device exploding. The south Korean company has started collecting all Note 7 globally and this time around, they are doing it in a completely different way. 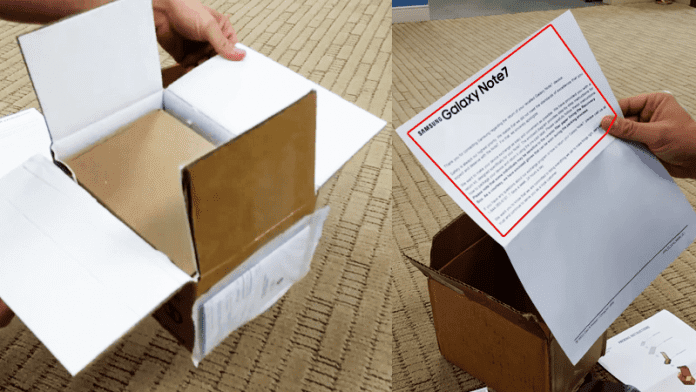 Samsung is now sending out a special box which will be used in the collection process and the box is fire resistant. The collection kit which is now been sent to Galaxy Note 7 users contains a special glove and also a fire resistant box. The main reason why Samsung opted for the thermal protective box is in case any unit explodes while it's been transported back to the factory. Samsung has also issued strict instruction which prohibits the device from being shipped by air to prevent any casualty incase it explodes mid air. Only mail by land transportation is allowed. This disaster is really going to cause a great set back for the tech giant. But on the other hand, Apple seems to be on the winning side as analysis shows that the Sales of iPhone 7 and 7 plus will increase astronomically has Samsung Stops Production of the Galaxy Note 7.